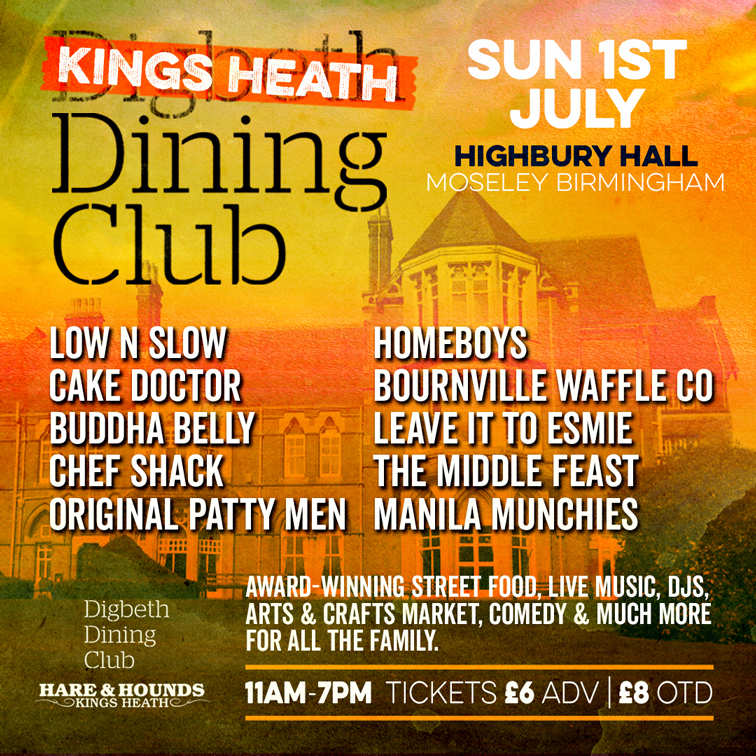 On Sunday 1st July, Kings Heath Dining Club returns to Highbury Hall for another afternoon/evening of food, drink, music, events… and probably a bit more food. Clue’s in the title. Situated on the grounds of this Grade 2 listed building, which was once the Birmingham home of Joseph Chamberlain, Kings Heath Dining Club will be open from 11am to 7pm. Tickets are £6 (adv) and £8 – available online through Skiddle, click here. To visit the Facebook Event Page, for direct event information and further links to tickets, click here. Fundamentally a celebration of street food, King Heath Dining Club will bring an array of traders to the B13 based Highbury Hall this weekend – currently advertising Original Patty Men, Low N Slow, Bournville Waffle Company, Cake Doctor, Leave it to Esmie, Buddha Belly, Homeboys, Chef Shack, Manila Munchies and The Middle Feast. There will also be live music from The Original Players, The Equators, and Aphrodite Strings – alongside Digbeth Arts Markets, comedy, wellness therapies, and retro gaming from Dead Pixels. And whilst you can only eat and drink as much as you your wallet will allow, all the day’s entertainment is included in the ticket price, with no age restrictions. Held in collaboration with the Hare & Hounds, Kings Heath Dining Club is the suburban split from the Digbeth based mothership – usually taking place on York Road, outside the venue that partners their Kings Heath events. 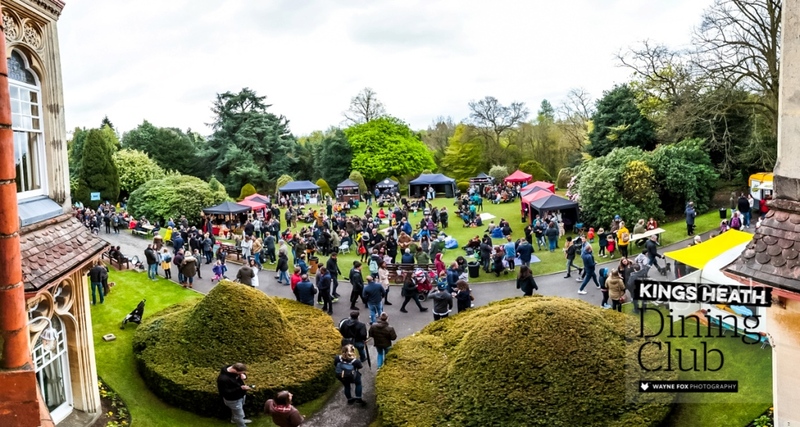 Holding their first event at Highbury Hall back in April this year, Sunday 1st July marks the start of three further street food summer showcases at the Highbury Park based mansion. Partnering with the Hare & Hounds seems like a shrewd move into the suburbs too, with the prolific entertainment venue having done more to shape the cultural cache of Kings Heath than a million plant pots or local councillors. And with a bevy of tried and tested foodies coming to Highbury Hall, it’s difficult to see where this could go wrong. Just don’t look up, I guess. Although Sunday 1st July is set to be the hottest day of an already pretty scorching week, so I’d only worry about the weather is you’re made of ice cream. All that’s left to do is cherry pick (again, pun intended) a menu to put to the taste test, and after some grueling investigative journalism (eating) we’ve gone for The Middle Feast – the Lucy Rhodes run Persian pop up that has some of the best Kebabs, shawarmas, mezze, and flatbread that you can get your mits on this side of the Mediterranean. And on Sunday 1st July, The Middle Feast will be presenting a new dish: Persian Spiced Buttermilk Fried Chicken, which comes with fries, slaw and harrisa mayo. Also available from The Middle Feast will be Cooked Whole Cauliflower Shawarma, Diced Lamb Kebab with Charcoal Hummus – plus a range of salads, smoked yogurt, sweet pickled radish, gluten free and vegan options. And whilst we couldn’t 100% confirm it, if you see the Halloumi Fries on the menu then we strongly suggest grabbing some before they sell out. In fact, get us some whilst you’re there too.